Successful leaders are able to set a direction for a team to follow, create a vision for success and find innovative ways to overcome obstacles. It has been often thought that most people in leadership positions are born with certain abilities and attributes that make them successful. However, studies consistently show that training and education adds significantly to a leader’s skill set when it comes to managing people and accomplishing goals. The professional team at P4 Security Solutions has decades of experience in many different facets of the security industry. Drawing from our diverse backgrounds in law enforcement, private security, military service and corporate training, we are highly qualified to create leadership training programs that are tailor fit to meet the specific needs of every organization. Our leadership training courses include the following areas of study. Defining the role of leadership. The distinction between leading and managing. Leadership styles & finding a fit. Providing direction, purpose and motivation. 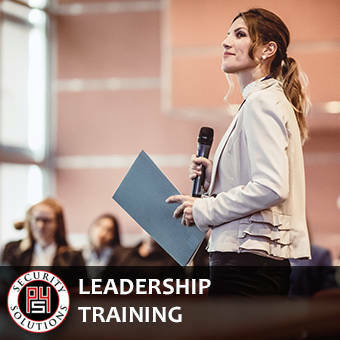 Because everyone of our clients’ businesses has its own set of strengths and challenges, P4 Security Solutions customizes and bases our leadership training program on detailed input from our clients to ensure that the course addresses their unique concerns. Contact us today to learn more about how our team of highly experienced professionals can design a leadership training program that will have a positive, lasting impact on your organization.